This is an excellent wireless doorbell if you are looking for an LED for visual alerts! 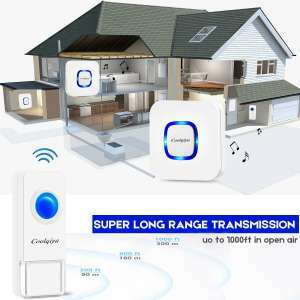 It is also a great option if you need to expand your wireless doorbell with more receivers or more transmitters (push buttons). The Coolqiya Wireless Doorbell has a wide operating temperature range and is fully waterproof too! Download the Coolqiya Wireless Doorbell Manual Here! The advertised range for this wireless doorbell is 1000 feet, but you must remember that this distance is unobstructed. Although that is a large range, you need to remember that there are certain objects that will interfere with the transmission of the wireless signal. Objects such as walls, electrical items, and even other wireless technology will weaken the signal as it passes through them. 1000 feet is much more than you are likely to need, and even if that range is halved due to other items, 500 feet is still plenty! You will be pleased to know that one of the 52 chimes is the classic ‘Ding Dong’. Other ‘tunes’ include bird songs, dogs barking, classical music, piano music and yes…even a Christmas song! You can set up different tunes for different push buttons if that is something you need to do. 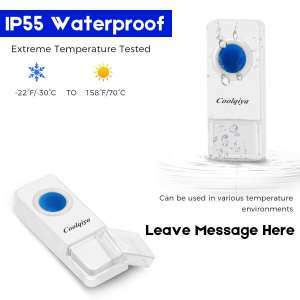 The Coolqiya is rated IP55 against dust and water. In basic terms, it is more than waterproof enough for a very heavy rainstorm! 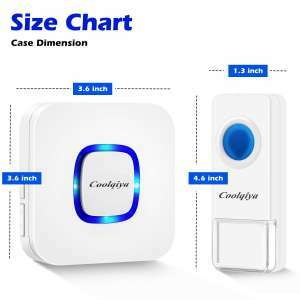 The working temperature range is also very wide, the Coolqiya wireless doorbell is rated to work in temperatures between -30℃ and 70℃. This is one of the best weatherproof doorbells we have seen. 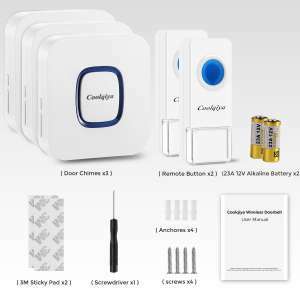 In terms of the hardware, the push button can be put on the doorframe using screws or adhesive tape, both of which are provided in the wireless doorbell kit. The chime is simply plugged into a power socket. 1. On the receiver – pick the chime you would like as your alert. 2. Press and hold the volume button on the receiver, until you hear the ‘ding’. 3. Press the push button you would like to match. At this point, you should hear the sound you have chosen. 1. Press and hold the ‘forward’ button on the receiver for around 5 seconds. It should ‘ding’ and flash. With the Coolqiya wireless doorbell, you will receive a 12-month warranty. Not only do you receive a warranty, but it is also backed up by a 24-hour customer support team, just in case you are having any issues with the device! They can be contacted at the following email address: support@coolqiya.com. I have said it before in this review and I will say it again! 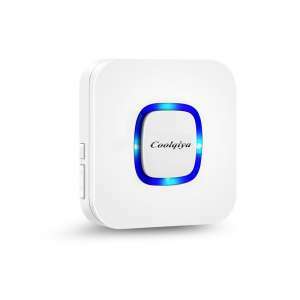 Coolqiya wireless doorbell is an exceptional choice for everything you need in a wireless doorbell! It is one of the top-rated wireless doorbells on Amazon and it is certainly top rated on here! 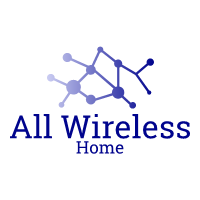 In fact, it has made it into our best wireless doorbell list for being one of the best wireless doorbells with multiple receivers! 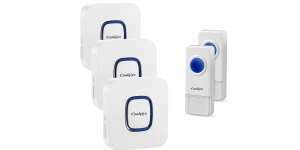 The Coolqiya Wireless Doorbell is an exceptional, dependable wireless doorbell that is the jack of all trades! Need 2 receivers? Need 3 receivers? How about more? Add over 10 receivers or push buttons to this wireless doorbell solution! Each pushbutton is IP55 rated, which means it can add being waterproof and weatherproof to its repertoire!